One of the three candidates in the North Carolina 2nd Congressional District race was arrested for stalking this past June. 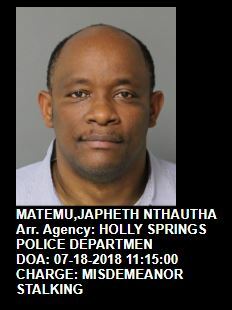 Japheth “Jeff” Matemu, age 45, was arrested by the Holly Springs Police department on June 26th and was charged with misdemeanor stalking and cyberstalking. The arrest occurred somewhere near 7550 Holly Springs Road and the charging documents are unclear on who filed the stalking and cyberstalking charges against him. Matemu is running as a libertarian in the North Carolina 2nd District Congressional race against incumbent Republican George Holding and twice failed former candidate for Lt. Governor, Democrat Linda Coleman. *Disclaimer: I live in the 2nd Congressional District. This entry was posted in CRIME, LL1885, POLITICS NC and tagged Japheth "Jeff" Matemu. Bookmark the permalink.